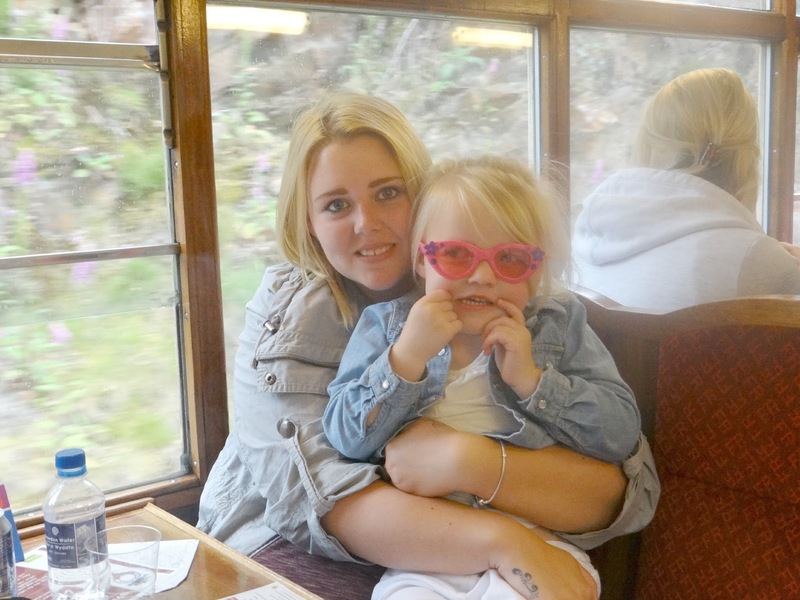 Sunday, 5th July we went on a train ride to raise awareness of Organ Donation. My partners Mother had a Kidney Transplant in 2011 so she got an invite to come on the train with others. Me, my partner and Elliw were invited by my partners Mother. Mia was in her Dads. We caught the train from Porthmadog which then took us to Blaenau Ffestiniog. I was a little worried on what we would do there but the weather was really nice and the sun was out in the morning. So Elliw was dressed in her new shorts, vest top and denim jacket and I wore my clothes along with my summer jacket. We arrived in Porthmadog by 10.15am. Elliw got very excited. We waited in line so we could get our tickets then off we went to find somewhere to sit on the train. Luckily it wasn't that busy and we got a seat on the first carriage. 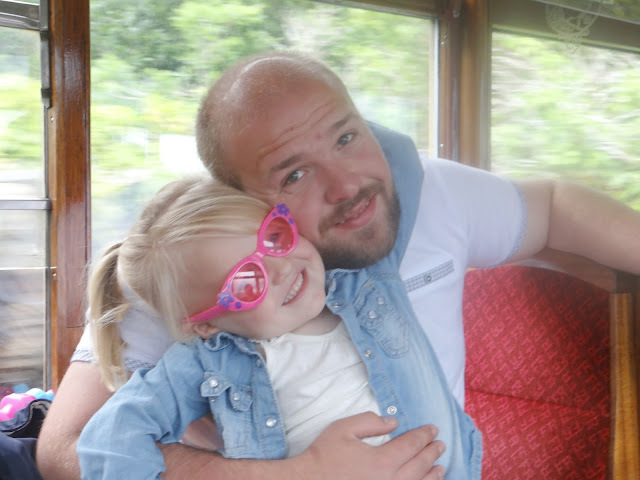 Elliw had a chance to pose on the front of the train, she was super happy! The chairs on the train were pretty uncomfortable but we had a table and a stunning view of the sea which was great. Elliw was getting a little grumpy and fed up. The train ride was just over an hour long journey. I hadn't packed any activities for her to do as I did change my mind about coming and I was just going to stay at home and sort out the girls toys but of course, I went in the end. As I mentioned. Elliw got a little grumpy at times. She had a few games on Daddy's phone and she was happy! Although she wasn't all that quiet either. 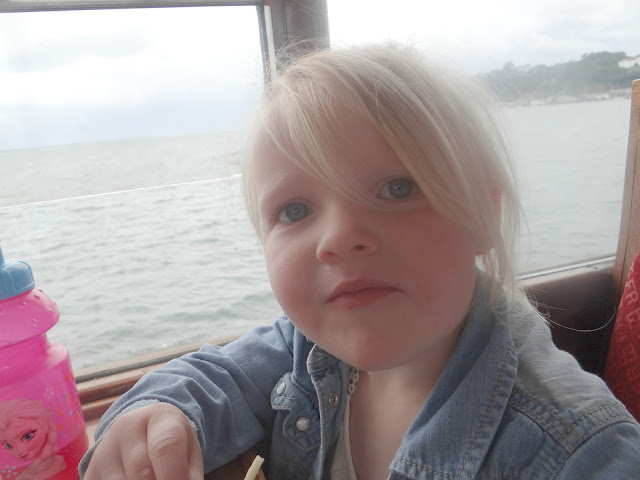 She had a few snacks such as cheesestrings, strawberries and a packet of quavers... two packets! We finally got to Blaenau Ffestiniog. Guess what? It was pouring down. As you can see. I wore my summer jacket. I was drenched. There was a choir singing on the station, so we stayed around a bit. Elliw didn't mind the rain as you can see, she is wearing her SUMMER sun glasses. 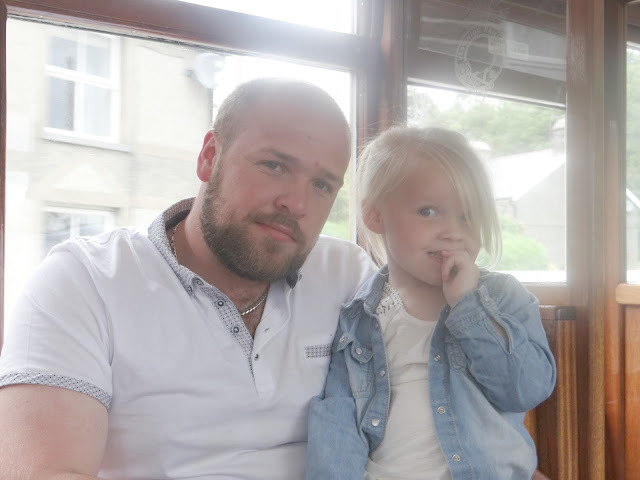 She got a little bored so she went to have a walk with Daddy to see the trains behind the train carriages. Ah it looks like a nice day out even though it rained! I'm never prepared for the rain at the moment, it seems to be sunny one minute and pouring down the next! 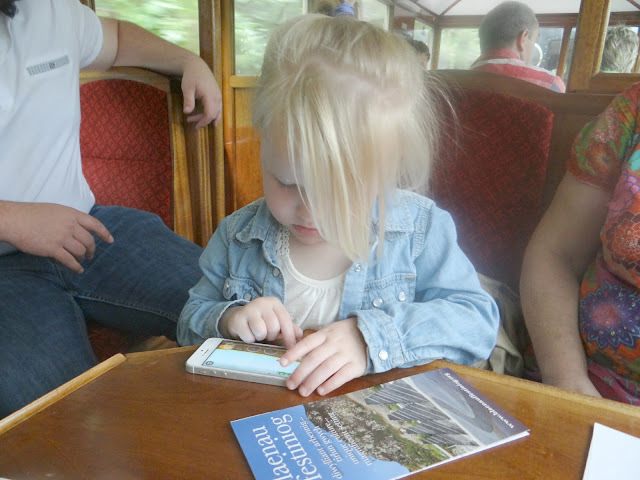 It looks like you had a great time riding on all the trains, even if the journey was quite long for Elliw. 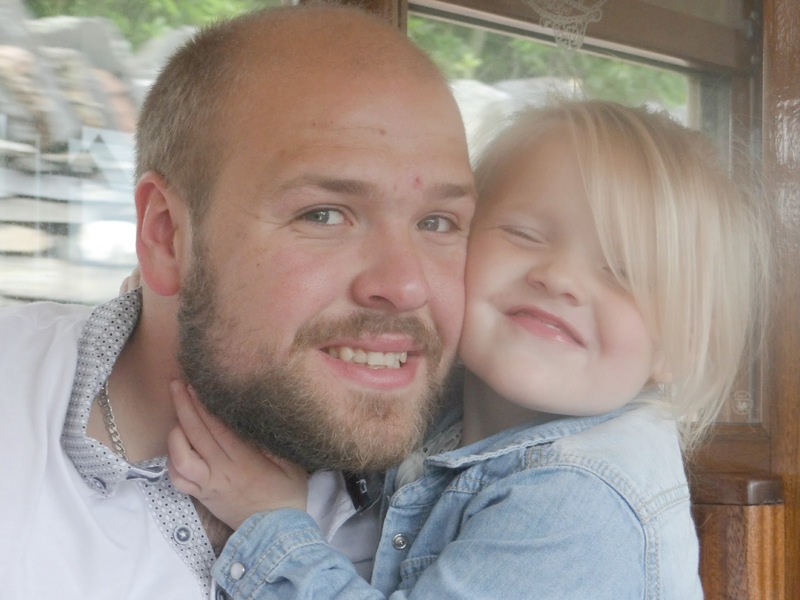 It's so sweet to see Elliw with her dad too, what lovely photos of the two of them together. It's great that even the rain stopped you from enjoying the whole day you enjoyed yourselves overall. Do pop over and link up to Country Kids too, this post would be perfect. Popping in from Magic Moments.